This is not a tax exempt website. ClassiX by Xstamper metal desk embossers have been specifically engineered to produce high pressure with minimal effort. 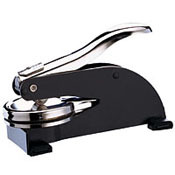 Embossing seals are valuable tools for notaries, architects, engineers, government officials, financial institutions or any corporation that produces official documents. You have the choice of your handle position. If you do not choose a position the embosser will be manufactured to emboss from the the bottom of the page or envelope flap. If you Choose the Top: This means that you will be able to emboss at the top of the document. From left to right. If you Choose the Bottom: This means that you will be able to emboss at the bottom of the document. From left to right. If you Choose the Left: This means that you will be able to emboss on the left side of the document. From top to the bottom. If you Choose the Right: This means that you will be able to emboss on the right side of the document. From top to bottom.